One of the first activities while conducting a penetration test in Unix environments is to perform a user enumeration in order to discover valid usernames.In this article we will examine how we can manually discover usernames based on the services that are running. 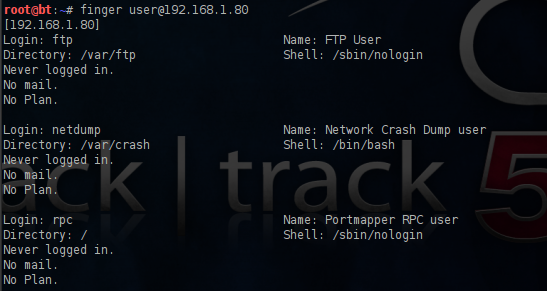 Lets say that we have perform a port scan with Nmap on our host and we have discover that the finder daemon is running on port 79. We can use the finger command in order to enumerate the users on this remote machine.For example if we execute the command finger @host we will get the following output. As you can see the root user is the only account which is logged on the remote host.Now that we have a specific username we can use it in order to obtain more information about this user with the command finger root@host. As the image indicates the finger command obtained information about the name,the home directory,login name and shell.Also we can see that the root user doesn’t have a .plan file. This specific command will enumerate all user accounts that have the string user.Alternatively you can use other words instead of user like admin,account and project. Older versions of Solaris that run the finger daemon are affected by an enumeration bugs.For example you can run the command finger 0@host and it will enumerate all users with an empty GCOS field in the password file.Additionally you can run finger ‘a b c d e f g h’@host and it will enumerate all users on the remote target. In SunOS there are RPC services that allow also user enumeration.For example the command rusers will return a list with the users that are logged into machines on the local network.Alternatively if you are looking for the list of a specific host you can combine it with rusers -al host. Another option is the rwho command which can be used also to enumerate network users.All the systems that are running the rwhod daemon will respond and an output will produced of the users that are currently logged in to these systems.This service runs at 513 (UDP) port. If you discover a host which is running an SMTP service (port 25) you can also use it for username enumeration.We can connect through telnet to the mail server and then we can execute the command help in order to see the available commands. As you can see from the image above there are plenty of commands but the commands that we will need for the discovery of valid usernames are the VRFY and EXPN. The image above indicates that we have successfully verify the existence of two users root and admin. In production systems it is almost impossible to find any of these services running due to this information leakage.However many Linux distributions include these daemons as part of their default installation. In nowadays this process can be done automatically through the nmap script engine but it is good to know also how you can manually discover usernames in Unix systems.Also many commercial certifications are still requiring from you to know how to enumerate users with these commands.